The Haikelite SC26 is a new light utilizing the 26650 battery format as well as the hard to find 26350 battery size with the included optional tube design. It comes in 5 different exterior colors and 4 LED options. Thanks to Banggood for sending this to me to review. Let’s take a look at this interesting light. Packaging is pretty basic, It’s a brown cardboard box, with a Haikelite sticker on the top. Inside is foam that is cut to the light’s shape. Included accessories are the 26350 tube, 2x orings, pocket clip, and manual. The manual is 1 half sheet of paper with a few technical details printed and operating instructions. 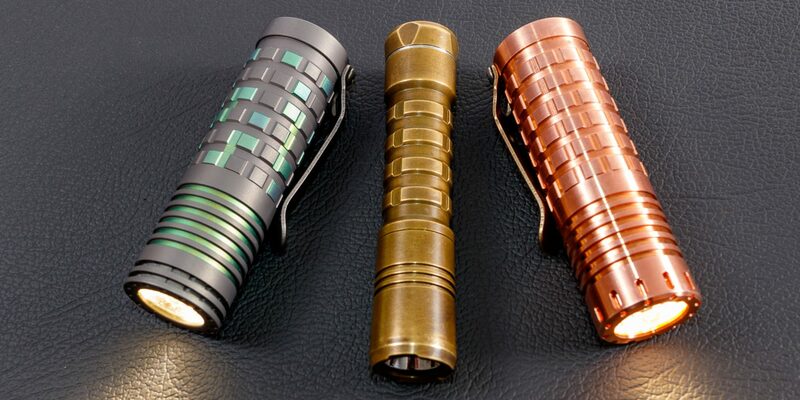 The light is made from Aluminum alloy, and is available in 5 colors of anodizing, Blue, Silver, Black, Teal, and Tan. The anodizing on my Blue SC26 doesn’t match. It seems the body tube is the outlier as the battery tubes, and end cap all match pretty well. The tail cap is small and has smooth rounded edges. Inside is a very stiff large spring. The body tube is what you would expect with orings on each side. Knurling is in a diamond pattern but not super aggressive. A clip does come on this light but it only fits well in the larger configuration, lens up carry. Due to the thickness of this light I don’t consider it a front pocket EDC, it would be fine in a jacket pocket. I would have liked to see a spot for a lanyard but it does not have one. I measured length with the long tube at 124.4mm, with the short tube it was 85mm. Diameter at its greatest is 35.3mm, and 32.1mm at its narrowest. Weight was 211.3g. No water rating is given but it has o’rings and seems reasonable for most uses. With the short tube it’s pretty similar in length to a Emmisar D4 with the 18650 tube. When the SC26 has the longer tube its about 1/4 “ shorter then the Thrunite Catapult V6. For my runtime test I used a 4500mAh KeepPower protected 26650 battery. Overall total runtime was impressive at 350 minutes from turbo. This long runtime distorts the graph a little as nearly all that time at about 30% relative output which is somewhere near 700 lumens. When the power gets low the light does some flashing of the emitter to let you know it’s about of of power. Turbo lasted for just about 1.5 minutes before step down with my battery. Turbo mode is thermally controlled but with a timer too. Thermal mode is configurable. I used a fan to cool the fan during my short runtime test. This light has a ramping UI which I like. It flashes to let you know your at the bottom or top of the range. Ramping UI is listed at 21 to 2050 lumens. To get to turbo when the light is on just double click. Double click again to go back to the previous level you were at. To adjust your ramping level just press and release when you want to stop. To decrease output do the the same. The light also offers configurable thermal protection between 44 and 55 degrees Celsius. The light also offers a 5 group mode UI that you can switch into. Make sure you check out the manual or the Banggood product listing on how to configure this and all that’s offered. There is only one mode that has strobe. The light does have lockout in the UI. When the light is ON double click followed by a long press to lock out the light. Repeat to unlock. This is not my favorite method because with the ramping UI you are long pressing a lot. So it’s easy to put the light in to lockout if you double click to shortcut to turbo and then want to adjust down. This light is able to run on 26650 batteries which is what I did my testing with. I used KeepPower 4500mAh protected batteries. It can also run on 2× 26350 batteries or with the included short tube 1× 26350 battery. I like the look of it in the short chubby design, the problem is finding high quality 26350 batteries. They do exist but they are hard to find and of unknown brands. MTNElectronics carries some but the brand is not mentioned and they have no reviews. This was similar to just about everything else I found including Banggood. I don’t like the safety aspect of using lithium ion batteries from an unknown, unlabeled manufacturer. Hopefully some 26350’s from a known manufacturer will hit the market if this size becomes more popular or I can get some of these unlabeled 26350’s to test with this light. It’s also worth noting the light has Battery level indicator via the switch. Greater than 3.6V it will be blue, Less than 3.6V it will flash blue and below 3V it will red flash. I like that the light has 5 color choices and 4 emitter choices including neutral white. Ramping firmware and backlit button, it could be faster and have Lockout revised. I like the size and feel in my hand with the large side switch. Large stiff springs, but slight left to right rattle. Sources for high quality 26350 are pretty slim. It’s not a popular sized cell. Mine came with fingerprints on the inside of the lens, I was able to easily disassemble and clean it. This light is advertised as an EDC, at least for me it won’t be used as a front jean pocket EDC, because that 26650 is just too big in diameter and I don’t like lens up carry with the clip, but I could easily see throwing this in a jacket pocket or bag. I like that it comes in a wide variety of colors as well. I wish 26350 batteries were more widely available because I like the small size in the hand with she short tube. Even in it’s longer configuration I like the size of this light because of it’s narrow profile for a 26650 battery. I wish it had a lanyard loop on it but even without one it’s a pretty nice light if you don’t mind a bit of Cree Rainbow. Banggood would like me to mention that this light can be found on their site https://goo.gl/KHhyym (Affiliate Link) and they have provided a coupon code of “ef3048” to get the light for $42 if you are interested in it.